A hernia mesh is implanted inside of the body. The purpose of a mesh is to strengthen the weakened muscles of the area with the hernia. Studies have shown meshes are effective for repairing hernias. 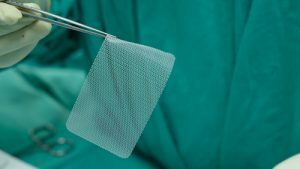 While the hernia mesh is effective, it does not come without risks. Infection is one of the main risks that is associated with getting a hernia mesh. Your body can recognize the mesh as a foreign material. As a result of this, your natural defense mechanisms are inhibited, and you can develop an infection. In many cases, infections can be treated with antibiotics. However, the mesh may have to be removed in order to treat the infection. Another treatment will have to be used in order to repair the hernia. Nerve damage is another complication that is associated with hernia mesh surgery. Fortunately, this is a complication that typically resolves itself within a few days. Moderate to severe pain is a sign of nerve damage. A local anesthetic can be used to eliminate the pain. If the pain does not go away, then the person may be required to get another surgery. Bowel obstruction and seroma are two of the other complications that are associated with hernia mesh. Seroma is the buildup of fluid in a tissue around an organ. Additionally, certain types of mesh are coated with omega 3 fish oil. This can cause an allergic reaction in some people. If you have been hurt by hernia mesh, then you will need to contact a hernia mesh lawsuit attorney. Hernia mesh complications are extremely common. That is why you may be entitled to compensation if you have suffered complications. This compensation can be used in order to pay for your medical bills as well as make up for lost time at work due to complications. Contact Alonso Krangle today at www.fightforvictims.com! We fight for victims.